New York based drummer Tomas Fujiwara has been slowly building a reputation for excellence. Whether in one of his many collaborative works, such as those with Anthony Braxton, Matana Roberts, Mary Halvorson, and Taylor-Ho Bynum, or as a leader, such as here, Fujiwara has been involved in surprisingly large number of stand-out recordings in the creative jazz scene over the last ten years. His drumming is both dexterous and muscular, but contains a subtlety that can be easy to overlook. 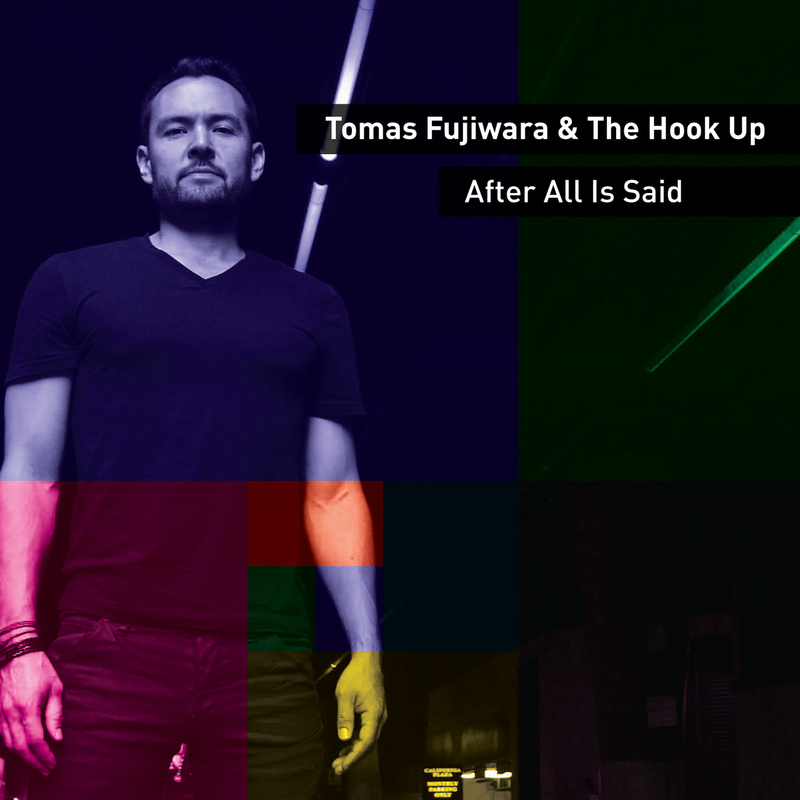 Fujiwara’s co-conspirators in The Hook Up consist of Halvorson on guitar, Michael Formanek on bass, Brian Settles on tenor sax and flute, as well as Jonathan Finlayson on trumpet. This group is not merely a showcase for its leader. Instead, Fujiwara’s compositions involve the collective as a whole, with each musician taking on prominent roles, often simultaneously. Immediately setting After All is Said apart from the group’s previous recordings is Brian Settles incorporating flute into the mix. To that point, the album opens with Lastly, featuring Settles blowing over an angular rhythm driven by Formanek and Fujiwara, as well as subdued speed picking from Halvorson. Unlike the rhythmic attack of Eric Dolphy or the classically-inspired James Newton, Settles’ approach to the flute is pointed and atmospheric, and contrasts well with Halvorson’s often herky-jerky guitar style. When not on flute, Settles provides horn interplay with Finlayson, usually over twisted accompaniment from Halvorson. Fujiwara stays busy, laying down dense textures. Formanek, to no one’s surprise, shines on both bowed bass and picked, playing leads as well as backing parts. Braxton’s influence shines brightly in Fujiwara’s writing – After All is Said clearly recites jazz, but with tight, complex writing, staggered rhythms, and superb execution. A very strong release. Brilliant local pianists Kate Campbell and Anne Rainwater play game-based music by Rozalie Hirs, György Kurtág, John Zorn, and an immersive collaboration with Danny Clay. Pre-concert party with the artists begins at 7:30; music proper begins around 8. NY City violist on tour. Repertoire features solo unaccompanied works for viola that have all been written in her lifetime, with an emphasis on composers who are women. Black Spirituals, Charles Barabé, Jean-Sébastien Truchy, Black Givre the best of the Bay Area and Montreal’s experimental music and video scene will descend on San Francisco’s Center For New Music, Saturday, July 25, $5-$10 sliding/FREE for members of CNM. New and recent works exploring resonance, order, and chaos for solo cello and solo piano by Elizabeth Adams, David Kant, Andrew C. Smith, Ma’ayan Tsadka, and K.C.M. Walker, curated by Indexical. John Zorn/Forro Zinho! Bret Higgins’ Atlas Revolt! Peter Brotzmann/Fred Van Hove/Han Bennink 1971! Steve Lacy & Steve Potts 1979! New from ForTune: Charles Gayle Trio! Trevor Watts & Veryan Weston! Ed Cherry Special Trio! Malerai/Uchihashi/Maya R! Marco Eneidi Screamin’ 4! Yells at Eels! Susan Alcorn & LaDonna Smith! Brooklyn Primal: Bill McHenry/Jerome Harris/Nicole Kampgen/Ed Schuller/Pete Davenport! 2 from Mara Rosenbloom/Darius Jones Qt! Plus Archival Discs from: Frank Zappa & the Mothers! Horace Silver & Woody Shaw! Weather Report 1980! Larry Coryell & 11th House! Waylon Jennings! Joe Ely! Dolly Parton! Karen Dalton! King Tubby! Bunny Lee! Scientist & Mad Professor! The Congos! King Jammy! Sun Ra Arkestra & Another Large LP Section! 6pm: FRANCOIS GRILLOT/TOMAS ULRICH/JEREMY CARLSTEDT! 5pm: LEAP OF FAITH: PEK-clarinets, saxes, double reeds/GLYNIS LOMON-cello, aquasonic/STEVE NORTON-clarinets, saxes/YURI ZBITNOV-drums!